The Small Business division of Parente Randolph is focused on services to small and family-owned businesses. 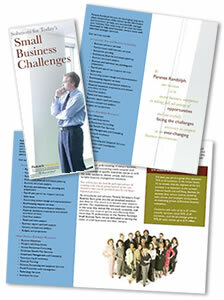 This trifold brochure was created for distribution to both their existing clients and potential clients. The brochure focuses on the challenges faced by smaller businesses and how the professional staff at Parente Randolph who specialize in small business financial advisory services can help them face those challenges.